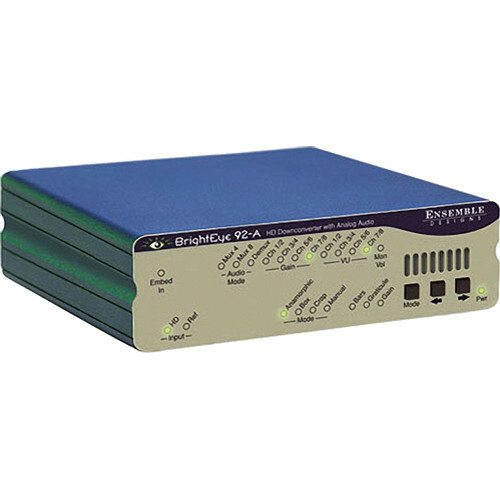 The BrightEye 92-A HD Down-Converter with Analog Audio from Ensemble Designs is a converter that will down-convert any type of HD signal, and output it as an SD-SDI or analog composite signal for broadcast or monitoring. The unit features a built-in frame synchronizer that allows you to produce asynchronous signals. An external reference input allows for genlock to a house reference, and the unit faithfully passes all vertical interval data and closed captioning information. The HDMI connector on the rear of the chassis provides a monitoring interface with LCD displays. This unit also handles up to (16) channels of embedded audio and up to (8) channels of analog audio streams. Embedded audio is safely routed around video processing. Two of the four embedded audio groups are available for mixing. You can monitor any audio channel by plugging a headset into the 3.5mm jack on the unit's front panel. The front-panel interface offers control of input selection, gain control, and test patterns, among other parameters. The unit can also be controlled through the BrightEye software package that is included with the unit and compatible with both Windows and Mac platforms. LEDs on the front panel provide a visual indicator of channel status. Note: Please note that a power supply is not included with the unit and must be purchased separately. Use this device to downconvert any type of HD signal as an SD-SDI or analog composite signal. This unit handles embedded audio and analog audio streams. The unit can be controlled through the push buttons on the converter's faceplate or through the proprietary software package included with the unit. The converter will work on both Windows and Mac operating systems.